4.2 out of 5 based on 48 bloggers and 3 commenters. 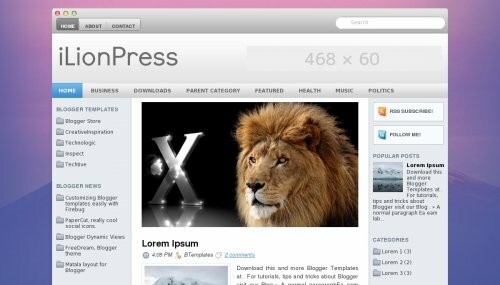 iLionPress is a free blogger template adapted from WordPress with 3 columns, left and right sidebars, rounded corners, ads ready, slider, social bookmarking icons, posts thumbnails and gradients. Excellent template for blogs about desktop or internet. your template is good but now i want to change the slideshow that is between tool bar and post.can you tell? Please tell me in detail. Hello does this template work for blogspot?